I remember the first time I witnessed a solar eclipse. We were told to never look directly into the sun, so I made my viewer. I took a piece of cardboard and used a pin to drill a small hole in its center. Then I could look through the hole in the cardboard and watch as the moon crossed in front of the sun. That was probably when my passion for science was born. We all know what an eclipse is. The primary definition is the total or partial obscuring of one celestial body by another. But it also has a secondary meaning of a falling into obscurity or decline. We are living in a time when the true gospel of the Bible is being eclipsed. We are losing the good news of the Word. Last week I mentioned the three components of D. L. Moody’s presentation of the gospel. Health, Wealth, and Prosperity Gospel è God wants you to be wealthy and healthy; if you are not it is because of unconfessed sin in your life. The Feel Good Gospel è Jesus is all for you; God’s wrath is subdued because God loves all people and all people will be saved (this is Universalism). The Political Gospel è God wants those in the Church to become overly involved in the political system; in essence, political involvement becomes an idol. The Social Justice Gospel è We need to take care of the orphans and widows; we need to look out for oppressed. But this is not the Gospel. None of these approaches, even with their strengths is the gospel. The gospel is all about Jesus. Paul summed this up well for us: For I determined not to know anything among you except Jesus Christ and Him crucified (1 Cor 2:2). Now I am no prophet, nor the son of a prophet, but one thing I can predict; that every one of our new converts that goes to studying his Bible, and loves this book above every other book, is sure to hold out. The world will have no charm for him; he will get the world under his feet, because in this book he will find something better than the world can give him. Moody actually lived at about the same time as Charles Darwin. Darwin lived from 1809-1882 and published his greatest work, “The Origin of the Species,” in 1859. Moody lived from 1837-1889. He started the Moody Church in 1864 and the Moody Bible Institute in 1886. So, Moody ministered at a time where the world was beginning to turn away from the biblical concept of creationism turning to naturalism. Evolutionary thinking represented the new way of thinking. It seems that ever since the American Revolution, many in the United States have wanted to become “like” Europe. I am reminded of the monkey in the zoo who quipped, “Am I my keeper’s brother?” So, the eclipse of the gospel began by denying that man was created in image of God. Moody spoke against the culturally accepted message that man evolved physically, socially, and morally. Moody taught about the difference between heaven and hell; he did believe they were real and distinct places. The truth is that man is dead, depraved, and deceived. Without God, man is a sinner who has fallen short of the expectations of God and His glory (Rom 3:23). Sin has led to hostility between man and God; there is enmity against God (Rom 8:7). God is holy and must judge sin. We are told that the wages of sin is death. Death is not the end of things; rather, death is separation. Physical death is the separation of the soul from the body. Spiritual death is the separation of man from God. Man is born spiritually separated from God, thus he is spiritually dead. Without remediation, man is eternally separated from God; as a result, he will face the wrath of God (Rom 2:5). But man is also deceived. Though he is dead spiritually—he is blind and deaf—he thinks he can see and hear. This deception is real. Man really believes he is okay and enlightened. He has no idea of the sin he is in. The sin of humanity is real and it involves all of us. “All we like sheep have gone astray; We have turned, every one, to his own way; And the Lord has laid on Him the iniquity of us all.” (Isaiah 53:6) Yet, it seems inconsistent that so many liberal thinkers deny the presence of sin. After all, the sin of man can be readily proved by reading the newspaper. So, man is separated from God by the great chasm of sin. 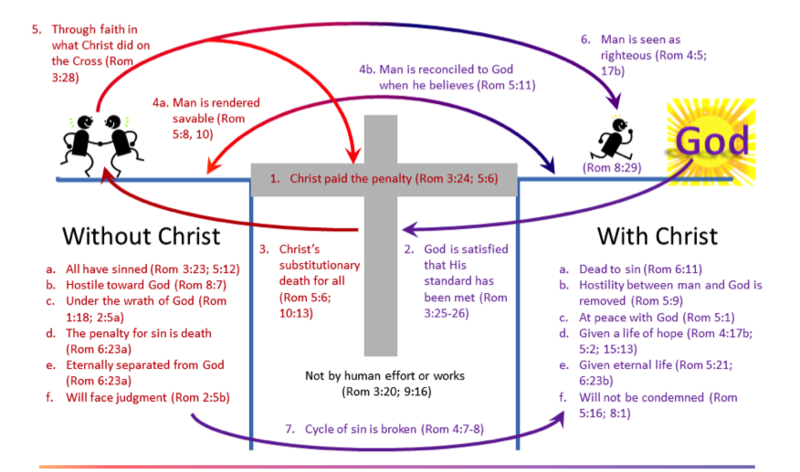 God offers forgiveness of sin and restitution in a relationship with Him (see the chart above, Rom 5:1-2, 9, 21; 6:11; 8:1). To do this, God’s standard must be met. Only a perfect sacrifice would serve. God had to come to mankind to redeem us. Only Christ’s death on the cross was the satisfactory sacrifice. Old Testament sacrifices did not take away the sin; they merely covered sin over. But they did point to the coming Messiah who would/could take away sin. The question becomes, “What are you trusting in?” Are you trusting in the blood of Christ on the cross? Only the blood of Christ is sufficient to take away all sin. The blood of Christ is enough. Many want to preach a gospel of perseverance. That is, you are not saved unless you demonstrate in life that you are saved. This puts salvation back into the hands of man. It becomes a works gospel. You are saved if you… We then fill in the blanks. You are saved if you go to church. You are saved if you live up to my expectations. You are saved if you don’t drink alcohol. The list goes on and on. All religious systems require a sacrifice of some type. There is no other religion on earth where God becomes the sacrifice. One of my favorite passages of the gospel message is John 5:24. It says, ““Most assuredly, I say to you, he who hears My word and believes in Him who sent Me has everlasting life, and shall not come into judgment, but has passed from death into life.” When we believe in Christ and trust Him with our eternal destiny, we are freed (forever) from the wrath of God; we will not face God at the Great White Throne Judgment (Rev 20:11). I trust that you have been regenerated. If not, might I suggest you take seriously the claims of Christ and trust Him today? Christ is enough. He is all you need. By trusting in Him, you too can be “regenerated, born again by the grace and power of God. If you have trusted in Christ, are you willing to share Him with others? Like the drunk above, there many you are exposed to every day who need to hear the gospel message. Are you willing to make presenting the gospel the passion of your life? Moody, D. L. Anecdotes and Illustrations of D. L. Moody Related by Him in His Revival Work. Ed. J. B. McClure. Chicago: Rhodes & McClure, 1878. Print. No Replies to "A Passion for the Gospel"